Dr. Newburger is a board-certified dermatologist who received her medical degree from New York University School of Medicine and completed her dermatology residency at Jackson Memorial Hospital in Miami, Florida. She is a Fellow of the American Academy of Dermatology. 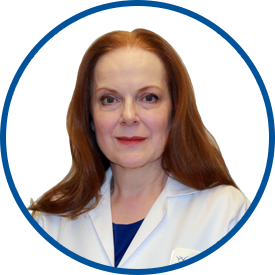 She is the founder of Dermatology Consultants of Westchester in Scarsdale, which has served the community’s dermatological needs since 1984. The practice joined Westmed Medical Group in May 2013. Dr. Newburger has been a community education program speaker on topics including skincare, environmental impact on the skin and new technology in skin products. She serves as an expert consultant to the Office of Professional Medical Conduct for the New York State Department of Health. She has served at the FDA in the Center for Devices and Radiologic Health. She has lectured extensively around the country and has been listed in Castle Connolly’s “Best Doctors in America” annual issues since 1991. Dr. Newburger is the author of the best-selling book, Looking Good at any Age. Dr. Newburger is simply amazing . I feelso fortunate to have her as my dermatologist. Dr Newburger has been my dermatologist for many years. I have complete confidence in her. She is an excellent diagnostician. Wonderful, caring, very smart doctor! Highly recommend *Dr. Newburger!! She could not be any nicer. Extremely thorough and ensured I understood all she said. *Dr. Newburger is an amazing Dr., she listens and knows her stuff. Dr Newberger is a rare doctor who is incredibly thorough and incredible caring. I never felt like Dr Newburger had one foot out the and hurrying me up. when it was over it was me that was satisfied . she never watch he watch she was with me and I only mattered at this appointment . Excellent physician who is also warm, kind and a great communicator; truly concerned about her patients. Dr. Newburger is just amazing. She's bothbrilliant and compassionate. I realize just how fortunate I am to have her as my dermatologist. I have recommended her numerous times to friends and family. I always have a positive experience with *Dr. Newburger. 10+ for Dr. Amy Newburger. Was very pleased with the visit (first time seeing this doctor). She was very thorough, did not rush, asked and answered questions. Dr Newburger is exemplary in all areas - knowledge, care and concern - She sets the bar - !!! Dr. Newberger is an excellent doctor, knowledgeable, personable and caring. Dr. Newburger is the best!